With Memorial Day upon us our Sunday Supper crew has teamed up to bring you recipes filled with red white and blue foods to celebrate the long holiday weekend in remembrance of those that gave their lives while in service to our great country. Colt and I spent 2 days trying to perfect a Patriotic Red White and Blue Cocktail recipe with the colors of the American Flag that not only looked pretty but was equally as delicious and easy to make. After many attempts to achieve gorgeous layers of red, white and blue with different fruit purees and cream we finally decided on a simple Patriotic Cocktail with whole berries soaked in a mixture of lime for a murky white color, 7up and vodka. A perfect cocktail to enjoy while celebrating an important day of reflection and patriotism. In 2 martini glasses layer 1/4 cup Blueberries and 1/4 cup Strawberries or Raspberries or a combination in each glass. In a martini shaker stir together juice of 1 Lime, 1 teaspoon Sugar, 4 shots 7up and 2 shots vodka. Stir until well combined and strain out ice while pouring mixture evenly between both glasses. Garnish glass with an additional Strawberry. As you slowly sip on the cocktail the berries will infuse with the liquor for an extra special treat to enjoy at the end. Whether your hosting a Memorial Day or 4th of July party or barbecue make sure to check out all the delicious idea's from my fellow Sunday Supper taste makers for a memoriable celebration after the recipe to amuse your guests. A patriotic Red White and Blue Cocktail filled with blueberries, strawberries, raspberries and soaked in a vodka mixture. A fun cocktail to enjoy for Memorial Day or 4th Of July. 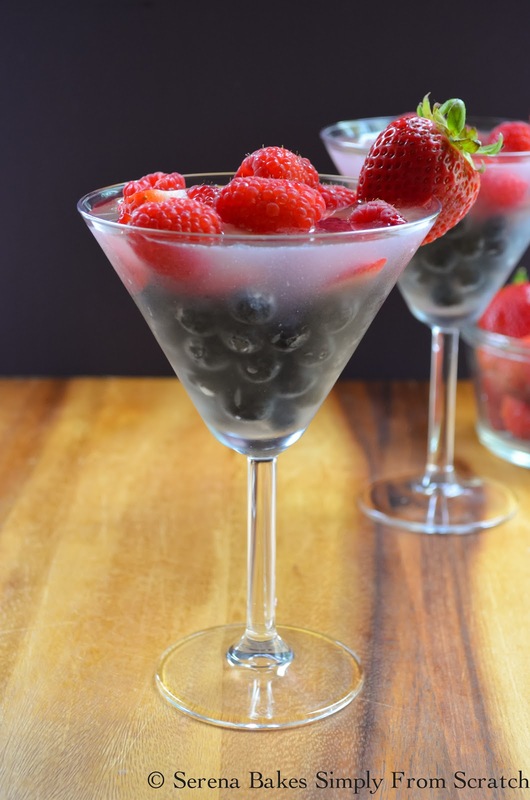 Divide blueberries equally between 2 martini glasses then layer with strawberries or raspberries. In a martini shaker stir together lime juice, sugar, 7up, vodka and ice until cold and sugar is dissolved. Divide vodka mixture evenly between 2 glasses. Garnish glasses with a strawberry and serve. Slowly sip cocktail and enjoy the infused berries at the end. A beverage and appetizer in one - brilliant! You get to sip then munch on the fruit. Cheers! Yes! I love this idea of berries soaked in a cocktail. Thanks for participating this week! Thanks so much for hosting and changing the name! A drink AND dessert all rolled into one! Sounds wonderful! amazing pictures and recipe!! way to go Serena! How fun are these? Great idea using fresh fruit in the glass! Beautiful! Memorial Day celebrations always need a festive cocktail. This is totally my kind of cocktail! It's so festive and beautiful too!! Such a beautiful drink! And I love those macerated berries! Oh yeah! I could've used this yesterday. I love fresh fruit in my drinks. I can't get over how beautiful your cocktail is. Sounds delicious, too!